So much has happened since my last blog, we have moved house and been entertaining house guests for a week (a family of five, boys 6, 4, & 18 months) two weeks later, busy busy, busy. I'm feeling very tired but now hopefully have a bit more time to start creating again. I love the new house we are renting, it has some fabulous features from the 70's, like the amazing retro light fittings and a shag pile carpet feature wall. Grrrr groovy baby. The best thing is it has a loft where I can escape, to immerse myself into crafting, with views that I can gaze out the windows across the roof tops. Finally a space of my own, very indulgent. 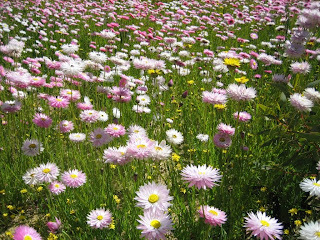 Spring has arrived in Western Australia with the wild flowers in glorious bloom. 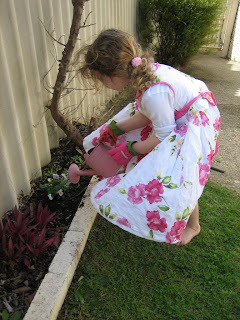 Ava watering her flowers, we also planted sunflower seeds, one week later shoots are popping threw the earth, Ava is very excited watching them grow. We also have discovered fig, pear & lemon trees, parsley, rosemary and grape vines.